We appreciate the feedback we receive from Calculators users. It allows us to continually improve the online Calculators, and look at ways to make them more useful. 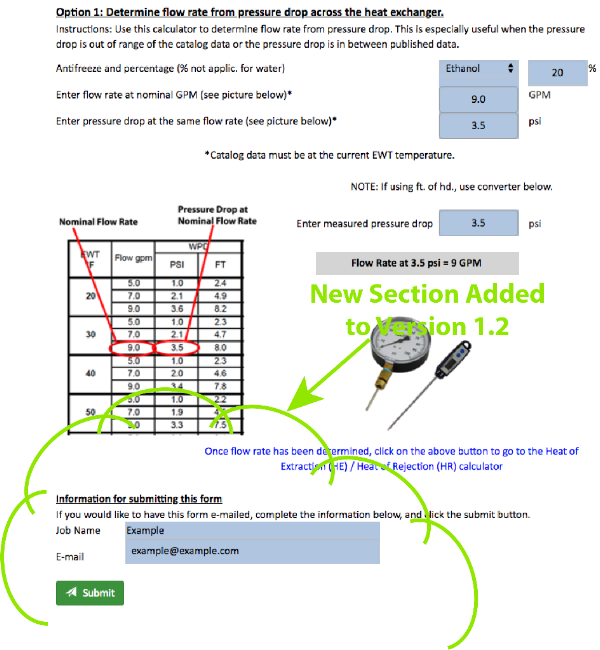 This month's update includes the addition of a Submit button to the Flow Rate Calculator and the HE/HR Calculator. The Submit button allows the technician to e-mail the results, since it's difficult to print on the job site (see screen shot below). We continue to expand our video library on the Calculators website. Some of the most frequent questions we receive are on loop flushing. So, we're concentrating on flushing videos at this time. This month, we've added three new videos, one on flush cart operation for pressurized flow centers, a video demonstrating power flushing, and a video on emptying the flush cart tank. All of these videos follow the flush cart operation manual. We will continue to announce new videos in this e-news as they are added to the library. After reviewing the videos, you may want to know more about how to avoid call-backs from a flat loop. Although Geo-Flo has a number of solutions, one of the most popular is the Pressure Battery™ (see exploded view, below). 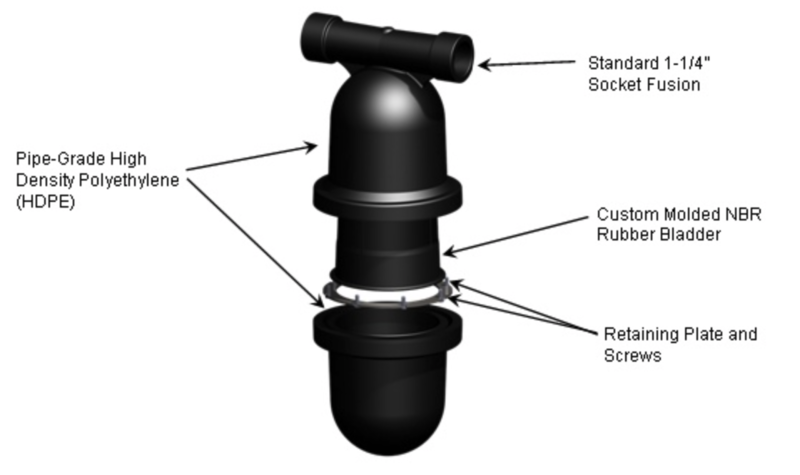 The HDPE tank may be heat fused directly into the piping system ("From Loop" connection to the flow center). For less than the cost of a service call, the added capacity can help prevent call-backs in the summer time when the pipe expands. For more information on the Pressure Battery, check out the "How it works" section of the Geo-Flo website. The Geo-Flo Pressure Battery is available through most geothermal heat pump manufacturers and through Geo-Flo distributors. For more information, contact your heat pump manufacturer or distributor, or review the submittal. To learn more about expansion tanks, download our expansion tank white paper. Copyright © 2018 Geo-Flo Products Corp., All rights reserved.